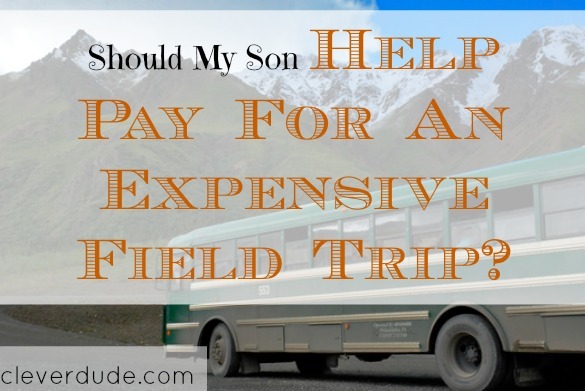 Kids And Finances: Should My Son Help Pay For An Expensive Field Trip? My son handed me a piece of paper, asking me to look at it. The first few sentences reveled it was parental permission form for a field trip. He brings these home periodically needing a signature to release the school from any liability should something happen while he is off school grounds. Sometimes a small fee is involved to help defray the cost of the transportation or admission to whatever they are visiting. This permission slip was out of the ordinary, however. The rest of the text described an overnight trip to Chicago for my son’s AP Physics class. The field trip came with a price tag of $246. The first thought that came to mind questioned the school’s logic for sending home a permission slip for a field trip with a fairly large price tag with only about a week to return the slip with payment. Rearranging a budget to absorb $246, especially weeks before Christmas, is not an easy task. While this wasn’t my son’s fault, it exemplifies that it’s almost necessary to have a special teenager emergency fund. Should we require our son to contribute some of his own funds towards the cost of the field trip? Not Required : The field trip is not mandatory, and not part of his grade. It’s simply an opportunity presented to students. Fun Activity : He wants to go because the activities sound fun and his friends are going. High Cost : Because it’s an overnight trip and they will be staying in a hotel, the cost is higher than the average school day field trip. He Has Income : My son works 15-20 hours a week at a part time job, and even after saving a considerable amount out of each paycheck, he has a significant amount of spending money. In summary, since it’s not required for his class, the field trip is simply a fun experience he wants to go on with his friends. So, he should at least pay part of the cost. At least that’s what my wife is asserting. The counter argument is that it is a learning experience that will enhance the subject matter of his Physics class. Since it’s essentially a school activity, maybe we as parents should pay the fee in full. I’m on the fence on this one, Clever Friends. I’m concerned that somewhere, deep in the bowels of my reasoning I’m agreeing with my wife only because it would be easier on our budget. What do you think, should my son be required to pay for part of his field trip? For me its more of a personal choice, personally I would be really happy to fund my parents trip or expenses of any sort. My initial reaction would be to have him contribute to the cost. Looking back at my own educational experiences, I have more appreciation for the ones that I had to fund myself. Of course, I guess it depends on what kind of student he is. It also sounds like a good financial lesson about needs vs wants and what to fund. I think it would be wise to have him contribute, even if it’s a nominal amount, say 25%. I think that will build his sense of responsibility, and he’ll probably put more effort into the learning elements of the trip when he has skin in the game. I think your son may get more out of the experience if he has to contribute at least part of the amount. Lots of kids are more savvy with money when it’s their own than when they are spending their parents’ funds. If he really wants to go, he should be willing to cover part of the cost. If he isn’t, then he probably doesn’t value the experience very much. I paid for all my primarily-fun events through high school, my parents paid for some things in part like my sports, and I applied for financial aid for anything academic like the AP tests. I didn’t even consider attending an overseas immersion trip for a week because we wouldn’t have had the money even had I paid for half. It wasn’t part of my grade, and though it could be educational, it was primarily going to be fun. In a situation like this, I would say it’s entirely fair for him to pay half the cost on the grounds that it’s optional, it’s likely mostly going to be fun, and there’s nothing like having some skin in the game to make you pay more attention and appreciate the experience more (or to choose more carefully going forward). And being notified a week before the trip sounds like someone really dropped the ball on organizing and informing parents! You could ask him how much he is willing to contribute. Explain to him about the short notice, the fact that it is not mandatory, and the high cost. He may be willing to throw in some money if he REALLY wants to go. I don’t think you should. Or ask him to, but then give him the money back when he gets back. So that he learns responsibility, but it doesn’t cost him. This is expensive, yes. But it’s school-related and he’ll get a lot out of it. And your son thinks that field trip activities sound fun. He wants to go on an educational trip. That’s pretty amazing, and I think it should be rewarded. If financially feasible, I think parents should always foster a sense of education and exploration for its own sake. And not put negatives on it like shouldering part of the cost, which might make him rethink it. Then again, my parents made me bank my entire paycheck to save for college — no car for me — so they were happy to shoulder the cost of education-related stuff. This sounds like a good predicament to have. It’s a chance to teach your son a lesson about paying for things he wants and allows him to decide what he wants to spend his hard-earned money on. I’d recommend having him pay for half. Explain that it’s an optional event and is expensive. If it doesn’t fit in your family’s budget, then tell him that and allow him the choice of paying for all of it or not going. But if possible, paying half as a parent seems reasonable. Good luck. It sounds like a fun trip and one he’ll remember â€” especially if he pays for most of it. And don’t forget pocket money needed during the trip. @Raj – I’m happy to fund my son’s trip….but the question is whether it’s a good learning opportunity in paying for things yourself, and that mom/dad won’t pay his way though life. Thanks for your thoughts! @Chuck – he’s a great student….and I have no doubt that he would get a lot out of the trip educationally as well as socially. Thanks for reading! @MoneyBeagle – that’s a good point…if he has to contribute some cash, he might be more apt to get something valuable from the activities – thanks for the insight! @Emily – I like the idea of finding out “how bad he really wants it.” 🙂 Thanks for sharing your thoughts! @Revanche – Yeah, I’m not happy with the school for having this pop up on such short notice. I think I may talk to the principal and see what they can do for the future…. @Amy – “half” was initially thrown around…but I’m thinking more like $100. It sounds like he’s really interested in going! @Abigail – I appreciate your opposing point of view…..it’s a tough decision. Either way he’s going to go – it IS an amazing opportunity. @Aaron – good call on the pocket money…maybe my wife and I could foot the bill for the field trip, and he has to supply his own spending money. Lots to think about!